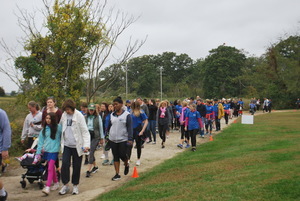 Dana’s Angels Research Trust (DART) brought together 350 friends and supporters for its first-ever DART to the Finish charity walk held at Greenwich Point Park on October 6. 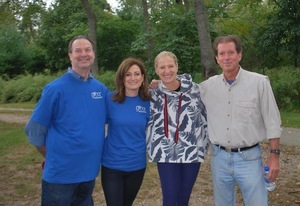 Dana’s Angels Research Trust was founded by Andrea and Phil Marella of Greenwich after two of their four children, Dana and Andrew, were diagnosed with the rare childhood disorder Niemann Pick type C disease (NPC). Dana sadly passed away in 2013 at age 19. But Andrew, who just turned 19 in June, is faring better due to being enrolled in a clinical trial to slow or halt the progression of the disease. NPC is so rare that only about 500-600 children in the U.S. are affected. This devastating genetic disorder, often called children’s Alzheimer’s, robs a child of the ability to live a long, healthy life, often becoming fatal in the teenage years. But, Dana’s Angels Research Trust is helping to change that fate. As a non-profit organization, DART raises funds to support pivotal NPC research — research that may also help millions suffering from Parkinson’s disease, HIV/Aids, Ebola, heart disease, stroke, Alzheimer’s disease and other disorders that appear to be related to cholesterol. 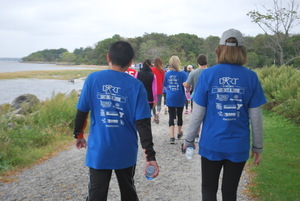 DART to the Finish raised more than $100,000 and the funds will support additional NPC research and clinical trials. 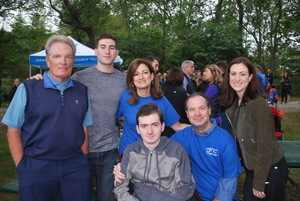 Radio personality Scott Shannon of WCBS-FM kicked-off the walk; Senator Scott Frantz and Representatives Fred Camillo and Mike Bocchino also attended to show their support. Special thanks to DART sponsors Jusko Wealth Management Group, Mallinckrodt Pharmaceuticals, the Byram Archibald Neighborhood Center, Chicken Joe’s, The Children’s Hospital at Montefiore, PepsiCo, Primary Home Care LLC, RAND Insurance, Serendipity, Threads & Treads of Greenwich and the YMCA of Greenwich. To learn more about Dana’s Angels Research Trust (DART), visit danasangels.org, on Facebook @danasangels, Instagram @danasangelsNPC and Twitter @danasangels.